Scroll down the page or click on a topic for links to helpful information. Feral cats are at home outside, but they can always use some extra help in cold or severe weather. In cold weather, shelter is actually more important for feral cats than food. Providing adequate winter shelter is one of a feral cat caregiver’s primary tasks. While cats are often great about finding shelter on their own, this can lead them to places that might be dangerous for them or areas where the property owners don’t want them. Other times, there’s just no sufficient option for them. Feral cats need warm, dry shelter to protect them. Feral cats can get frostbite on their ears, nose and paws. Feral cats typically build a protective coat for winter, but the effectiveness of their fur as insulation is greatly reduced if it becomes wet or frozen and can often times result in hypothermia. They can die from exposure if some protection from the elements is not available. Provide enough shelters for everyone. Some cats like to mingle; some cats prefer to have their own space. Cats rely on body heat to stay warm, so keep your shelters small for only a few cats. A space just big enough for three to five cats is best. For more populated colonies, go with multiple shelters of a larger size. A shelter doesn’t need to be expensive or elaborate. There are many types of shelters that you can build or buy pre-made. Shelter will be warmer and cozier if you put loose insulating material inside. The material must be dry and loose, so that the cats can burrow into and underneath it. Straw and hay may look similar, but they’re very different when it comes to insulating your feral cat shelters. Hay is used for animal feed—it draws and holds moisture, which you don’t want in your cat shelter. Hay, because it’s moist, can become moldy and some cats are reportedly allergic to hay and can develop nasal sores. Straw, the dry leftover stalks from harvested crops, repels moisture, making it ideal for keeping cats and other animals warm and comfy all winter long. Straw resists the wet and keeps a shelter warm, and is the best choice for insulation and bedding. Straw is less prone to mold or rot, and does not carry risk of an allergic reaction by the cats. Straw usually comes in bales, but you only need a fraction of a bale to line your cat shelter. Consider sharing a bale with other caregivers or surround your cats’ shelter with bails of straw. Straw can be purchased at Clyde’s Feed & Animal Center (they locations in Hamburg and Lockport). Contact Clyde’s for availability – http://clydesfeed.com. Shredded newspaper will also work. DO NOT USE folded newspaper, blankets, towels, carpeting, fake sheepskin, or any material that holds moisture. Cats can only lie on top of these materials so they actually draw out body heat and defeat the purpose by making the cat colder. Some caregivers use Mylar thermal safety blankets as bedding. Mylar is a product that retains body heat. Mylar blankets are inexpensive and can be purchased at places like Walmart and survival and outdoor stores. You can use hardwood shavings (not cedar or pine) but keep in mind that softwood shavings are not suitable due to possible toxicity. For shelters, size matters. The shelter must trap the cats’ body heat to warm the shelter’s interior. If the shelter is too large, it will be difficult for the cat’s body heat to keep the space warm. Cats give each other body warmth and will huddle together in the cold. A space just big enough for three to five cats is best. A good shelter size is at least 2 x 3’ and at least 18” high. Larger shelters are not necessarily better, since heat disperses quickly, leaving the inside as cold as the outside. Shelters should be checked regularly to ensure their optimum quality and function. When deciding what kind of shelter to use, remember that some of the low-cost suggestions will need to be checked and replaced more frequently than some of the more permanent and professionally built shelters. You must be able to change insulating materials regularly to ensure they stay dry. Make sure that the door is only big enough for cats. The door should be 6-8″ wide to keep out wildlife and larger predators. The opening should have a flap or an L-shaped entryway to keep cold air from blowing in. If neither option is possible, make sure the door faces away from prevailing winds or faces a wall. Put the door at one end so the cats can huddle at the other end out of the wind. As the cats grow accustomed to their new shelter, it may be desirable to add additional protection from wind or other elements by placing a door flap made of heavy plastic or vinyl to each entrance of your roughneck home. Some cats will resist entering a shelter with only one exit as it puts them in a vulnerable position. You may need to include two entrances in your cat shelter so that predators and bully cats can’t easily trap them in their homes. You can ensure that the cats are protected by making shelters waterproof, windproof (especially in cold climates), and elevated off the ground. Discarded pallets from shipping firms or hardware, farm supplies, or pet stores are a good option for elevation. The space beneath the shelters should be blocked from drafts. Insulation is a good material to use. Consider surrounding your cats’ shelter with bails of straw. TIP: One way to break the wind and create more protection from rain is to place two shelters facing each other, and then place a board on top, spanning the two roofs. Shelters should blend in with their surroundings so that they are not obtrusive to neighbors. Cover them with leaves or other brush or paint them a dark color. Moving shelters into wooded areas away from buildings, parking lots, and other high-traffic areas is also a good idea for cat safety and to avoid neighbor complaints. Wildlife may decide to make their home in the shelters you provide for the cats. Reducing the shelter door to an opening 6” wide may solve this predicament. Do not use repellants because most of them will repel the cats as well. Some caregivers have resorted to providing additional shelters, accepting that some will be used by wildlife. Rubbermaid Roughneck totes are a popular way to provide a safe and secure shelter for feral cats. Rubbermaid Roughneck is preferable because it is durable. This shelter is very effective and easy to make. 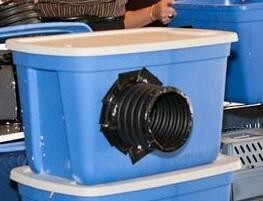 You can buy large pieces of Styrofoam insulation and cut to size or use a Styrofoam cooler. Then simply add straw to help keep cats warm. The shelter utilizes the 18-gallon Rubbermaid Tote and is most suitable for one cat but may hold two depending on the cats. 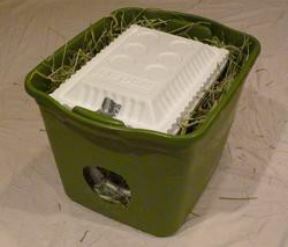 For 2+ cats, simply replicate these instructions using a 36-gallon tote and a larger Styrofoam cooler. 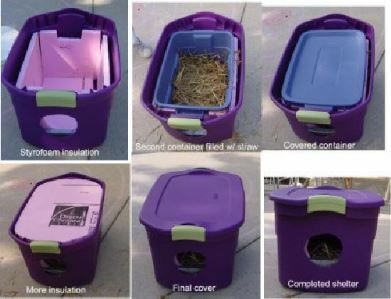 Check out these detailed instructions on how to build this outdoor protective cat shelter. TIP: Having difficulty cutting the plastic? Try blowing hot air from a hairdryer on the area where you plan to cut. This softens plastic and makes it easier to cut through. The shelter utilizes a 36-gallon Rubbermaid Roughneck latching tote for the outer box and an 18-gallon Rubbermaid Roughneck for the inner box. It is suitable for 2-3 cats. Some versions of the Roughneck Home add tubing at the entrance to help block wind, snow or rain. Be sure to make the tubing entrance large enough for all cats to fit through. © 2013 Feral Cat Focus Inc.